NJ State Command Sgt. 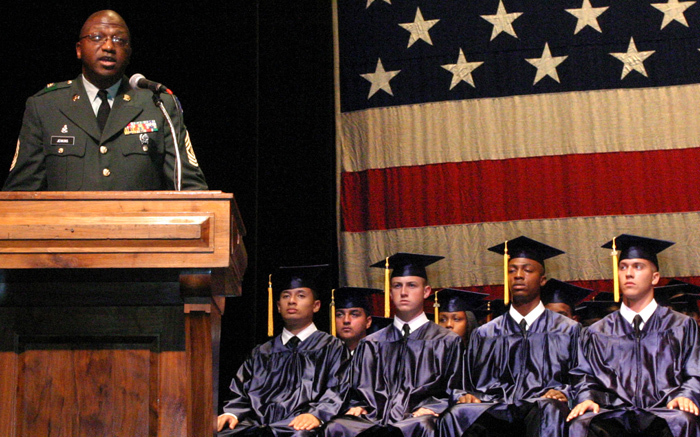 Maj. Jerome Jenkins (left) was the guest speaker at the NJ National Guard's Youth ChalleNGe Academy's graduation ceremony on Aug. 26. More than 100 students graduated from the program. Photo by Sgt. Shawn Morris, 444MPAD. When Maj. Gen. Rieth called and advised me that I had been selected as the next State Command Sergeant Major, it was with great pride I accepted the most difficult, challenging and rewarding enlisted position within the State of New Jersey. the tradition of working hard for our joint forces and their families. Following in the footsteps of Command Sgt. Maj. Adkins is a very difficult task. He was an outstanding Soldier who truly cared for our Soldiers, Airmen and their families. He is the true keeper of the colors and a Soldier who provided strong leadership during our time of need. I am proud to have had him as a senior enlisted advisor and mentor over the years. days were quickly over…I am up and running. As the National Guard transitions, so must we as noncommissioned officers. Every NCO must mentor our Soldiers and Airmen to keep our Guard trained and ready to serve. I will do my part to ensure that we have the right Soldiers in place to run our formations. aboard, you immediately saw changes in the Senior NCO ranks at the Major Subordinate Commands. In the near future, there will be more new faces in units across the state. support of Operation Jump Start. Sgt. Paul M. Gunning and we are working together to make sure that ‘Joint Forces’ is not just a spoken or written phrase. We want to insure that ‘Joint Forces’ means just that, an active partnership between our most important assets, the men and women that wear the green and blue suits. We will continue to leverage our forces and take advantage of the unique skills each entity brings to the mission. In closing, I am looking forward to working with our leaders in our effort to build and maintain a reliable, relevant and mission ready force. You can count on me to be a strong voice for our enlisted Soldiers, Airmen and their families.